Three days, two nights for under $600. From budget-friendly accommodations to activities without the cost, experience Santa Monica without breaking the bank with help from SMTT’s new “Beach Chic on a Budget” itinerary. Check into one of the city’s budget-friendly hotel options to find that accommodations in Santa Monica can be surprisingly affordable. With starting nightly rates at under $200, guests can enjoy stays at Gateway Hotel Santa Monica, Comfort Inn Santa Monica-West Los Angeles, Days Inn Santa Monica, Hotel Carmel, Ocean Lodge Hotel Santa Monica Beach, Ocean Park Inn, Rest Haven Motel, Santa Monica Motel, Sea Shore Motel, Seaview Hotel, SureStay Hotel by Best Western Santa Monica, and Hostelling International LA/Santa Monica during their visit. 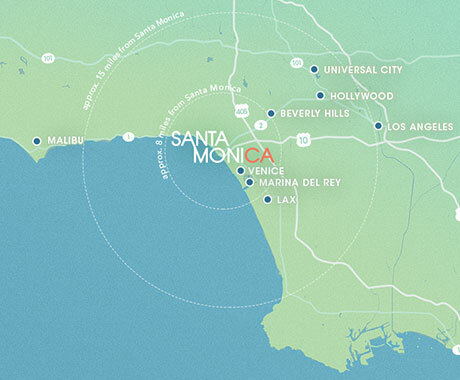 At these properties, guests will experience perks like luxurious locations, art and design-focused décor, accessibility to Santa Monica’s famous beaches, pier, shopping, dining and leisure activities, and free breakfast, parking and high-speed wifi. The sprawling Third Street Promenade is the bustling hub of Downtown Santa Monica. This pedestrian-only open air shopping destination is only two blocks from the city’s popular beaches and is noted for its two weekly farmers markets, terrific shopping, street performers, ample dining options and of course, people watching. A visit to Bergamot Station places you in the epicenter of Santa Monica’s arts and culture scene and within one of the largest collections of art galleries in the nation. As the home to over 40 art galleries, Bergamot Station features traditional fine art, contemporary art, glass art, prints, sculpture, fine art photography and others; admission is free. Named by Travel + Leisure as one of “The World’s Coolest Ferris Wheels,” the 13-story Pacific Wheel is the world’s first and only solar-powered Ferris wheel. Take in stunning panoramic views of the Los Angeles coastline and Santa Monica Mountains from more than 185 feet above the Santa Monica Pier for only $5 per ride at Pacific Park. Located on the top floor of Hotel Shangri-La 1301 Ocean Ave, Santa Monica (Arizona and Ocean Ave.) Perched atop the iconic Hotel Shangri-La is Santa Monica’s only open-air rooftop bar and lounge. ONYX effortlessly captures an elusive sense of Hollywood glamour at the ocean. This exclusive hideaway blends a timeless Art Deco design with a world-class ocean view. Enjoy specially priced drinks and small plates Monday-Friday from 4-6 p.m.
Santa Monica is now home to one of the largest full-service bike centers in the nation. Located in the heart of Downtown Santa Monica, visitors are able to live like a local and embrace the eco-friendly lifestyle of this bike-friendly community by choosing from a variety of bike rental options as well as repair services, bike tours, valet parking and travel information. Santa Monica Bike Center full day bike rentals cost $30. Nekter Juice Bar is the home of fresh juices and smoothies packed with robust greens, nutritious snacks, acai bowls, and bottled Nekter Grab n’ Gos. Stock up on healthy snacks at the Santa Monica Farmers Market on Arizona, between Ocean and 5th Street, Santa Monica Named the best in the country by Travel + Leisure, the Santa Monica Farmers Market sets the tone for local dining. With nearly 200 different growers and food purveyors at the beach city’s four weekly farmers markets, Santa Monica continues to attract famous chefs who value locally grown food and the foodies who want to explore the diverse culinary offerings. Enjoy a fresh and affordable lunch at one of Perry’s Café and Beach Rentals‘ four beachfront café locations. Broad, glistening beaches stretch for 26 miles along the scenic Santa Monica Bay, with 3.5 of those miles falling within Santa Monica proper. Primary beaches include Santa Monica State Beach and Will Rogers State Beach, both of which are popular for swimming, running and beach volleyball. Located just south of the Santa Monica Pier is the original location of Muscle Beach, the birthplace of the physical fitness boom of the 20th century. Original Muscle Beach has since been fully restored and refurbished, and now serves gymnasts, acrobats, and ambitious onlookers as an extensive gymnastics training area. Other features include: chinning bars at various heights, parallel bars, rings, a small jungle gym and padded gymnastics area for children. The South Bay Bike Trail begins at the northernmost point of Santa Monica at Will Rogers State Beach, and then scenically winds its way through Santa Monica State Beach, the famous Santa Monica Pier, through the Venice boardwalk and past the Venice Pier, all the way to Hermosa and Redondo Beaches, to end at Torrance County Beach. The trail runs for 22 miles and is the perfect way to take in this famous stretch of Pacific coastline. A short and refreshing bike ride just north of the Santa Monica Pier is Annenberg Community Beach House—the country’s first and only public beach club and a Gold LEED Certified building. This public facility is located on five acres of oceanfront property that was initially developed during the 1920s by William Randolph Hearst for actress Marion Davies. Today, visitors can take a dip in the original marble pool, play volleyball, have lunch, take yoga classes and learn about Santa Monica history with free docent tours at the Marion Davies Guest House. Rent out a chase lounge by the historic pool for $10 a day. Main Street is where the locals go. This eclectic street oozes laidback beach lifestyle and a commitment to sustainability – it has the most certified green businesses in Santa Monica as well as a community garden. Main Street is known for its eclectic collection of restaurants, boutiques, cafes, design galleries, bars and more. The restaurant within The Victorian’s romantic, historic building in the heart of Main Street serves delicious traditional America cuisine, paired with an impressive list of beers, wines and specialty cocktails – all 50% off from 5 – 8pm. This “secret” subterranean bar is hidden below a popular wedding and events venue and offers a sultry speakeasy vibe for cocktailing and live music. The entrance—through the parking lot behind The Victorian and down a flight of stairs—is appropriately hard to find. Elaborate chandeliers, leather armchairs, and bourbon cocktails complete The Basement Tavern’s Prohibition-era feel. Tongva Park is the brand-new seven-acre park in the heart of Santa Monica. Designed by James Corner Field Operations, the team behind New York City’s celebrated High Line Park, Tongva Park was inspired by the Southern California arroyo landscapes of washes and ravines that once defined the site. The urban landscape features an abundant and ambitious plant scheme, contemplative walking paths, soothing water elements, and two viewing platforms with majestic views of the Pacific Ocean. 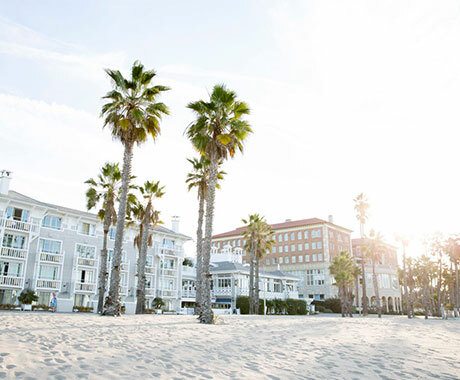 Along Santa Monica’s idyllic Montana Avenue lies the city’s upscale and open-air retail destination, a neighborhood flush with stylish boutiques and innovative wellness experiences. The city itself has long been known for being at the forefront of health and beauty trends, and a pleasant stroll down Montana Avenue allows visitors access to many of the experiences behind this reputation, all within 10 tree-lined blocks. Relieve the soreness from your body and the stress from your mind at Montana Avenue’s new Cha Spa, where experienced massage therapists perform relaxing and invigorating head, foot, and body reflexology massages. A 30-minute foot reflexology massage starts at only $20. Primp your hands and feet with a manicure and pedicure at Tracy’s Nails, one of the four nail salons to be recently recognized by Santa Monica’s new Healthy Nail Program. Enjoy a traditional manicure and pedicure for $35.